This oval shaped proeprty development for sale in Newlands is adjacent to the recently completed and popular 6 Mona Crescent, and Monorgan Mews. It is situated on the doorstep to Newlands cricket and rugby grounds and within a few minutes walk to amenities such as Cavendish Square, Virgin Active, Kelvin Grove and more. 3 Mona Crescent is also located in the catchment area for top schools and walking distance to the Jammie Schuttle service bound for UCT. Newlands is a highly sought-after and central part of the popular Southern Suburbs. Sized between 271 and 291 sqm, homes. As the homes will be bought direct from the developer, transfer duty will not apply. Homes are price from R6 500 000 VAT INCLUSIVE. Remote controlled access, electric fencing, CCTV cameras, private and secure parking and garaging, as well as security guard quarters. Units are set up for ADSL conduiting, dual view HD connectivity and common refuse room. 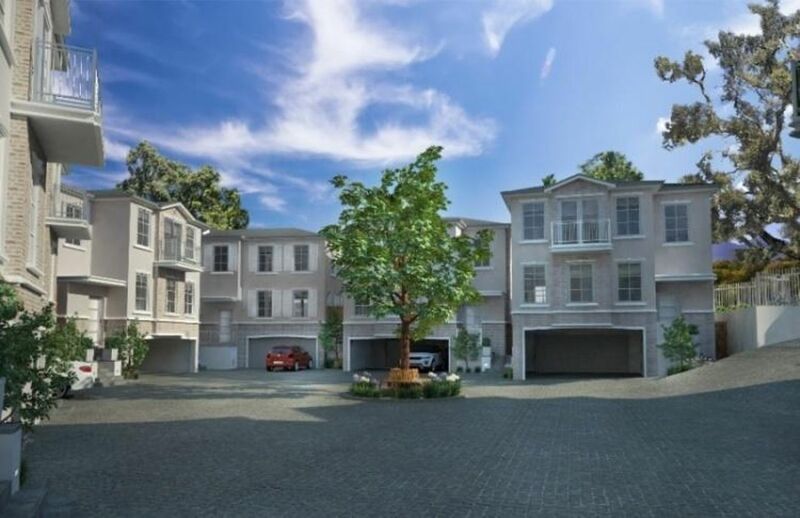 Homes are provided with landscaped gardens and patio in an already established tree lined setting, providing an aesthetically pleasing private and spacious living experience. Possibility of borehole. Each Modern-Georgian home is set over three levels. A basement/garage below ground, with a further two secure parking bays. The ground floor comprises of the kitchen/scullery and opens to dining and living area and private garden. A guest restroom leading to study/ bedroom completes this level. Top floor features choices of three to four bedrooms with two bathrooms or all en-suite. Buyers can choose from a range of modern flooring, bathroom and kitchen finishes, or can opt to customise their homes to their own specifications.